Author Chat with Scott Seegert, Plus Review! his book, plus a review! In describing the “Jimmy” line of books that are being produced under the aegis of James Patterson, the foreward to your new book says that kids do the best job of making books that kids will love. How did you involve children in your creative process? SS: As far as involving kids in the creative process of our books, we do get feedback from presentations and school visits with kids. You get a feel for what they really like and what they don’t care for as much. We learned, for example, that they love Kelvin’s dog, Lightyear. But, then again, so do we. JM: I run a cartoon camp for kids. I am an adjunct professor at the College for Creative Studies in Detroit, MI, and have coached youth sports for years. As a father of three, now 19, 22, and 24, I have plenty of material to draw from. I live the goofy sit-com dad scenario. I bounce our crazy ideas for the book with the kids from my camps and even my own kids. As adults, what are your personal credentials for stepping into that “kid” role? What helps you channel your inner 12-year-olds? SS: I have three kids, now aged 18 to 23. But they used to be younger. There’s a lot of material to be mined there, through both what they did at those younger ages, and what they liked. Another key to stepping into that kid role is never having fully stepped out of it in the first place. Perpetual mental youth, so to speak. JM: Whose an adult?! As Scott points out we are kids in adult bodies. What helps creatively is that I still watch cartoons on TV. I read and purchase new comics to this day. I actually just watched a Godzilla movie with my family. I really enjoy instructing our Entertainment Arts and Illustration students at CCS to create and work on their own stories. For example, I recently helped a student create her own little sea monster cartoon. A personal creative trick is how to brainstorm. I am a big believer in being random and letting any idea come forth no matter how silly at first. We can edit & exclude it later! Think like a kid at all times! Studies show that kids love to read funny books, but it’s harder to find them. Why do you think that is? Is writing humor much more difficult? SS: I guess I don’t know if it’s more difficult or not. I’ve only written funny books, or should I say books that I think are funny. Humor is always a matter of taste. In my mind, it would be more difficult to write a book about the social tendencies of nematodes. You know, because of the research. naturally for Scott. I have been teaching humor and cartooning to kids for over twenty years now. We are in the business of telling dad jokes. Young readers love Notebook Novels, but even 13 years after the first Wimpy Kid Book, it’s still hard to find literature in that format. What are the challenges of this format that make it harder to publish? SS: What makes it hard to publish is that the big players dominate the market to such a degree that it’s difficult for anyone else to get a foot in there. As far as physically creating the book itself, it takes a lot more effort than a non-illustrated novel, no doubt. On our (the creator’s) end as well as the publisher’s. I can’t give enough kudos to the poor book designer who gets assigned one of our books. JM: One of the things that make it hard to find, publish or create more humor literature like the Wimpy Kid Books, is the Wimpy Kid Books. It’s great that Jeff Kinney helped create this hybrid category, and that those books are so successful, but there is very little room in the minds of young readers for anything else. The retail blueprint and branding is so deeply rooted with loyal young readers and retail partners that most kids have blinders on for other books. That is always the problem with best sellers. I’ll never forget when I was at a school event promoting Vordak in costume. A child came up and tugged on my cape and asked: “Mr. Vordak, where are the Wimpy Kids Books?” I then asked this youngster if he would like to look through our Vordak books. “No thanks,” he said, and ran off. What comes first, the pictures or the text? Tell us a little about how the different elements of your book come together. SS: For Sci-Fi Junior High, we started with the very basic concept of a middle school in space. John then spent time sketching and doodling character designs, after which we got together and decided which ones we liked best. I assigned them characteristics and personality traits based on their looks. There’s a lot of brainstorming involved on both our parts. We get together and come up with the general plot points and the overall direction of the story. Then I write it and John illustrates it, but we’re in constant contact during the entire process. Typically, I’ll write a chapter and include descriptions for the art. Other times, John will come with something that’s just so cool I find a way to work it into the story. Unlike a lot of author/illustrator tandems, we’re fortunate enough to be able to work very close together, physically. My office is right next to John’s studio. We even have a secret hidden door between the two rooms so we can pass top secret information back and forth without being detected. design sketches per Scott’s suggestions. It is a real collaborative brainstorming and working process. I loved the list of “Mighty Mega Supergeniuses” of your youth in the dedication, and those influences are very clear throughout the book. Was there any standard middle grade fiction that influenced you as well? SS: When I was in the middle grades, I was a huge fan of Marvel comics. At one point I would buy every superhero comic Marvel put out every month. I didn’t read much standard middle grade fiction because I was very into the visual aspects of what I read, the art. There wasn’t much available in the hybrid format at that time, at least not that I recall, so it was comic books for me. That’s why I love writing the kinds of books John and I work on. Books like SCI-FI JUNIOR HIGH and our VORDAK THE INCOMPREHENSIBLE series is exactly what I would have dived into if they were available when I was a kid. JM: The creation of the hybrid novel category in general was a big influence. Books like Middle School, Dork Diaries, and Big Nate, but to be honest most of my influences are from the comics, novels and childrens books of my generation: Dr. Suess, Garfield, Peanuts, Caspar, The Incredible Hulk, Spiderman, and MAD Magazine. I always loved the visual storytelling in comic books and strips. As for novels, I read Doc Savage and Mary Shelly’s Frankenstein in my later middle grade years. Do you worry that kids might not want to read your book if their parents suggest it? A lot of my students don’t read Mad magazine now, and I wonder if it’s because their parents did! Do you think that part of the appeal of comics and pop culture is the fact that adults frown upon it? SS: No, I don’t worry about that. I think it’s pretty obvious to them when they take a look at our books that they aren’t being force fed something stuffy or literary. And it’s not only Mad magazine. I don’t get the feeling kids are that into comic books anymore, either, to tell you the truth. It’s become pretty much an adult genre. And the availability of the hybrid, highly illustrated middle grade novels probably has a lot to do with that. I craved art with my stories when I was a kid and didn’t have the book options available to satisfy that. Today’s kids do. more reading for pleasure, drawing, and makerspace programs. There is a big push now for more novels that incorporate STEM topics. You were ahead of the curve with Vordak. Will future volumes of Sci Fi Junior High include some more science topics? How many books will this series contain? SS: We’re currently working on a second book, Sci-Fi Junior High 2: Crash Landing, and hope to have the opportunity to do more. We have a lot of fun with the science aspect of the books, although we’re not worried so much about strict scientific accuracy. Artificial gravity, for instance, doesn’t actually exist. But that doesn’t stop us from having a lot of fun with it. It is science fiction, after all. In book 2 we have some fun with magnetic fields and an anechoic chamber, so kids will be introduced to those concepts whether they like it or not. JM: Yes, Vordak has some science and technology that all supervillians have. Lasers, age reduction, shrink rays, time travel, are all found within the book. Sci-Fi Junior High also has many science inferences such as how gravity effects the school. Biological references of species and some theories about wormhole/portholes are explored. I was never a good student of science, however I was always mesmerized by the magic of science rooms. All of those wonderful devices, models, posters and charts fed my imagination. At home I had a complete collection of those How and Why Wonder Books of Science. Presented by James Patterson's new children's imprint, this gleefully illustrated space adventure is a laugh on every page. That's a lot of laughs! Well, at least Kelvin won't have to worry about math homework anymore. Sci-Fi Junior High is an out-of-this-world story about friendship, accepting our differences, and the fight against evil... bunnies. Yes, evil bunnies - don't ask. 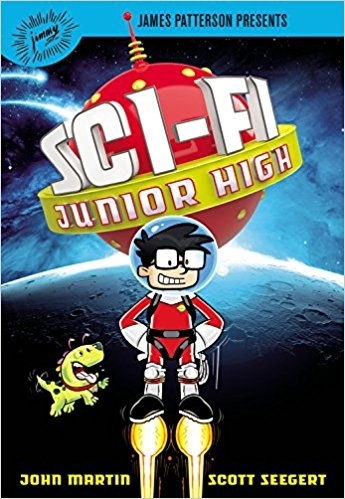 *Click HERE to read a review of Sci-Fi Junior High! Author Chat with Kayla Olson (Sandcastle Empire), Plus Giveaway! Author Of The Week: Chat with Julie Eshbaugh (Obsidian and Stars), Plus Giveaway!! Author Of The Week: Chat with Emily R King (The Hundredth Queen), Plus Giveaway!! Author Chat with John Clause Bemis, Plus Giveaway!